Robert Francis Kennedy was the seventh of the Kennedy family’s nine children and eight years younger than his brother, John F. Kennedy. Athletic, competitive, tireless, courageous and determined to succeed, Bobby had a brief but extraordinary political career. While still at Harvard, he joined the United States Navy during World War II. After receiving his law degree he worked for the criminal division of the Department of Justice but also helped run John’s campaign for the Senate. In 1960 he was campaign manager for John’s race for the Presidency. Appointed Attorney General in his brother’s administration, Robert was also the president’s closest confidant. He was also Attorney General under President Lyndon Johnson but resigned in 1964 to run in New York for the Senate. Elected, he served from January 1965 until his assassination June 5, 1968 in a Los Angeles hotel while campaigning for the Democratic nomination for President of the United States. His wife Ethel was pregnant with their eleventh child when he died. In 1969, Palestinian assassin Sirhan Sirhan, was convicted for Robert’s murder. Robert’s critics called him driven and vindictive, willing to do almost anything in pursuit of his causes. His admirers saw a man committed to helping the poor and stamping out injustice — a man who passionately embraced struggles and principles. He is remembered for his non compromising battles against racial injustice and organized crime while he served as Attorney General. “Bobby saw the world in black and white terms. You were either on the side of good or on the side of evil. 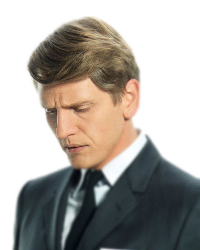 I’m not sure that Jack saw the world in those terms, but with Bobby, there was no middle ground,” says Barry Pepper. “Bobby had been a choir boy and was a devout Catholic. Because he was younger, he was taken much more under his mother’s wing, while his father’s focus was on Joe Jr. and Jack. I believe he learned compassion from her and perhaps the more ruthless, dogmatic side of his nature came from Joe,” Pepper explains. “He genuinely touched people (especially the poor) in a way that his brother Jack never did. When he’d go out campaigning, he would lose his cufflinks, his hair would be a mess because people would be screaming and clawing at him. There would be frenzy surrounding him,” says Pepper. “In this series we also wanted to show the family-man side of him, and what a deeply devoted father and husband he was. When he was outside the political arena he was a very different person. He spoke very gently, thoughtfully and quietly in their private conversations,” Pepper adds.